An article that I read supporting Malthusian theory and concerning vegans and speciesism, reminded me of entomophagy, which I introduced in Jiminy Cricket. Those readers who recognise ‘A Tale of Two Maggots’ as an allusion to Dickens’ A Tale of Two Cities, should be aware that the French connection is not Les Deux Magots. This is the name of a famous Paris restaurant that I used as my setting for Marrano. Located in St-Germain-des-Prés, the restaurant is named after the two figurines (les deux magots) on display and has no connection with maggots or entomophagy. Nevertheless, the menu of Les Deux Magots includes molluscs and crustaceans, but those offered represent hardly a scintilla of the edible species in these two classes and the restaurant has no edible insects on the menu. At least not yet. This despite insects as a food source (entomophagy) becoming increasingly available and insect farming now being developed commercially. In China cockroach farms have seen the price of dried cockroach increase tenfold since 2010, making entomophagy a better investment than gold. 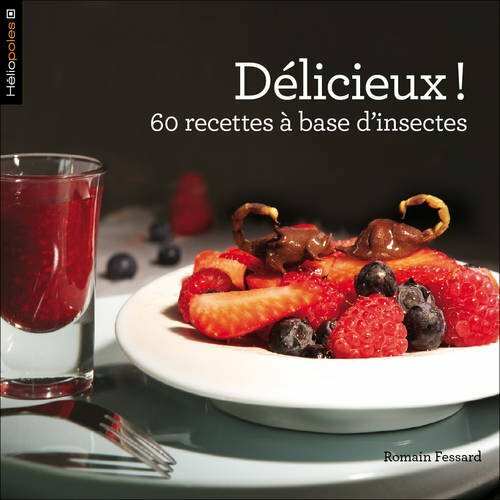 The picture below shows how a variety of edible insects can enhance the sushi but they could equally be canapés served at Les Deux Magots. A Tale of Two Maggots is my French connection to the larvae of the Cotinis nitida or Green June Beetle. Technically the larvae should be called grubs, the term maggots specifically relates to the larvae of flies. Grubs (vers blanc) are found in my compost bins, especially those of the June Beetle, which look quite edible. It occurred to me that if anyone knew how to cook them it would be the French. I’m sure that there are other sources, but thanks to The Old Foodie I sourced the 1885 book The Animal Food Resources of Different Nations for the following recipes¹⋅². ¹In Paris, a grand banquet was given for the special purpose of testing the vers blanc, or cockchafer worm (grub). This insect, it appears, was first steeped in vinegar, which had the effect of making it disgorge the earth, etc., it had swallowed while yet free; then it was carefully rolled up in a paste composed of flour, milk, and eggs, placed in a pan, and fried to a bright golden colour. The guests were able to take this crisp and dry worm in their fingers. It cracked between their teeth. There were some fifty persons present, and the majority had a second helping. The larvae, or grubs, generally, not only of the cockchafer, but those of the ordinary beetles, may, according to some naturalists, be eaten safely. Alternatively: ²Roll the vers blancs, which are short and fat, in flour and bread crumbs, with a little salt and pepper, and wrap them in a stout piece of paper, well-buttered inside. Place it in the hot embers and leave it to cook for twenty minutes, more or less, according to the degree of heat. On opening the envelope a very appetising odour exhales, which disposes one favourably to taste the delicacy, which will be more appreciated than snails, and will be declared one of the finest delicacies ever tasted. My second really is a maggot, being the rat -tailed maggot of the drone fly. These maggots are not edible, living as they do in fetid stagnant water, they readily transmit disease to humans. I inadvertently created the ideal environment for the drone flies to lay their eggs when I attempted to make a rhubarb leaf insecticide. Having put the leaves into a container for later use, I then forgot all about them. They were only brought to my attention when I noticed a putrid smell, which turned out to be the soaked and decayed matter now in the container. That and a large number maggots swimming amongst the putrefaction. My first instinct was revulsion and an impulse to dispose of the maggots. However, I noticed that these were not normal maggots in that they had ‘tails’. It transpires that drone flies are ‘good for the garden’ and should be encouraged, so I left the maggots to pupate. Pingback: Physiologie du Goût | Aasof getting serious!